There are 30 posts in this thread, and it has been viewed 22179 times. NOTE: This was a former Game of the Week discussion thread! 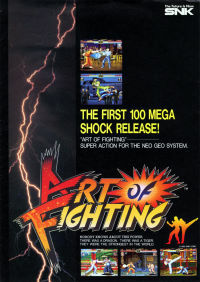 Art of Fighting, called Ryūko no Ken in Japan (which translates literally to "Fist of the Dragon and Tiger" , was one of SNK's earliest fighters. It's notable due to some of the new things SNK tried to add to the genre; the camera zooming, the special move bars, taunts and also visible damage to the characters as they get hit. 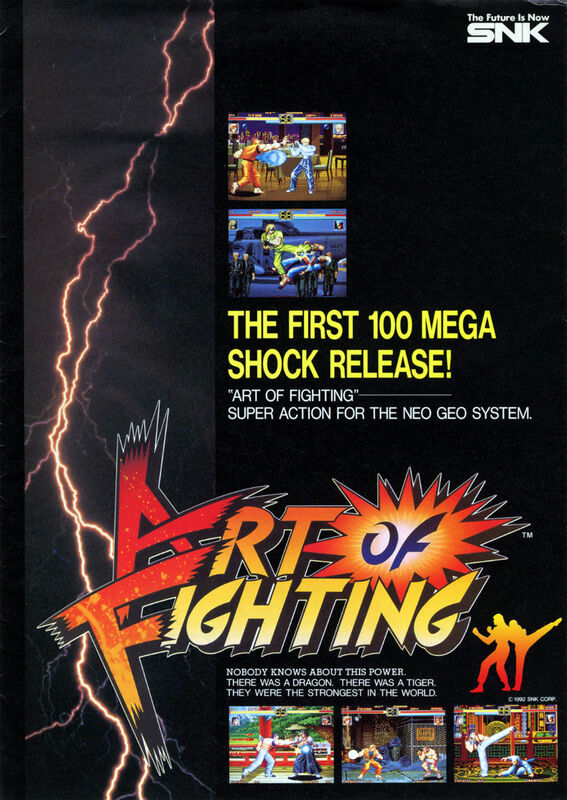 Do you have as much affection for Art of Fighting as I do, or do you think it was a mediocre at best attempt by SNK to steal some of Capcom's thunder? Let us know below! 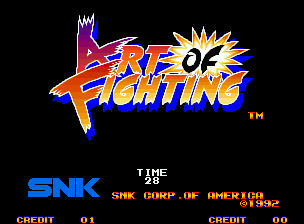 Art of Fighting is a nice classic game that while being dated is still really fun to play. I never played this in the arcades only discovering it through emulation many years later so I don't have the same feelings of nostalgia that some others here must have and have more affection for Fatal Fury and World Heroes which I did play in the arcades. However like I said it's a fun game and I've really enjoyed playing this one. I don't want to be too critical but one thing that always bothered me about this game was the fact that you or the opponent could become dizzy after only one hit. This can be a bit frustrating especially when you are up against Mr. Karate with his very long lifebar. I do like the spirit bar system for special moves though, it's a nice original idea. The three different bonus rounds are a fun part of the game. Pretty good, has a bad rep outside of the Neo community but the first one is very solid, i like it more than the original Fatal Fury. I've never played it actually. Will give it a try soon! I like the mini-games which are something I actually miss in games these days. Otherwise its a rather forgettable game for me. Art of Fighting is good as it is mostly. The detective mystery style storyline of kidnapped Yuri sure is rare and brings back the memories of the disappearance of Dr. Muckley from NAM-1975. I wish I knew why they call Ryo, his family and his friends' art of fighting Kyokugenryu. What does it mean? I know why Takuma wears a mask but why does have it have look so stupid with a big hooter, what is he, Pantelone from Commedia Da L'arte? Plus he is sometimes called Mr. Karate. Karate is a rotten kiddie way of fighting from the TV cartoons, the proper term for Takuma's way of fighting is Kyokugenryu warrior and nothing more. Plus the final scene should be renamed not Karate Gym but "Martial Arts Theatre", it doesn't look like a gym does it? All I'm saying is that little bits and pieces could be improved. In the SNES version of Art of Fighting, if you beat King with a special attack and reveal her breasts and bra, she will say something you don't see in this version "Now you know my secret! No one knows I'm a girl!". 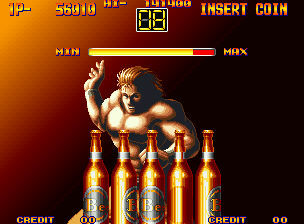 King in fact is my best and most favourite character in the entire Neo-Geo characters. 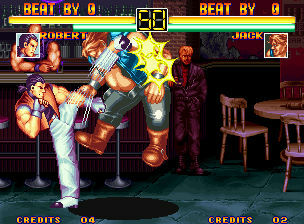 Robert I like to play with better than Ryo because he has more leg attacks and fights more calmly and reluctantly. 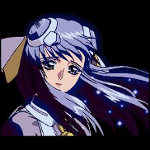 I wish the Neo-Geo CD had some deleted scenes from the game to show how Yuri was kidnapped, how she escaped and how Takuma was blackmailed. 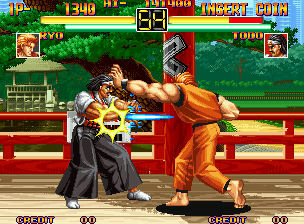 The scenes are high in quality with both sprites and graphics. If you'd like to see the scenes fully mapped out see what scenes I have accomplished in www.vgmaps.com ane enjoy it. Not the greatest, but awfully nostalgic for me. I remember first seeing it playing an old pub in my hometown. I still can't do the Ryuko Ranbu in the first one. 1. In AOF2 Geese's Office Block looks futuristic and in the 1980s they didn't have hologram graphics except for weather and fire effects but nothing as 3D as Geese's Model. 2. Yuri is a preteen or an actual teen. By the time the King of Fighters 94' takes place in 1994 Yuri should be adult and yet she is still a teen girl. 3. Other people like King, Ryo and Robert who appear in the King of Fighters 94' are more or less the same age since Yuri's kidnapping and they should be middle aged in the 1990s unless they still keep their young, beautiful/handsome looks and voices despite age progression. Is there any explanation for the glitches in the storyline? Have all the Art of Fighting characters drunk gallons from the fountain of youth and age regressed? SNK Corp and Takara - they made a mistake, perhaps they or someone else should recompose the storyline to take place in 1989 two years before Terry assumingly kills Geese. Although Geese is originally after Jeff Bogard whose death took place in 1981, he should instead be after Tung Fu Rue and Takuma will want to do know such thing being used as a tool to kill Tung for Geese's reign, but the problem with my idea is the explanation of Geese's quick ageing from a Guildroy Lockheart looking man to a mean faced fighter unless of course his fight against his opponent in AOF 2 lost him his handsome appearances. Do you think what I am pointing out in virtually the biggest importance to fix in the game if it could be fixed? Please tell me. 1. He had a fancy monitor display in his office, whats so futuristic about that? 2 and 3. KOF takes place in a separate time line from that of Art Of Fighting and Fatal Fury/Garou. looking back, i think this game's a bit of a bimbo inasmuch as the graphics and sound were excellent for the time but the gameplay was no where near as deep as world heroes 1, let alone street fighter 2. and i think this its biggest problem. its also hard as nails which would put a lot of people in the first place from really appreciating it. that said, the game was very ahead of its time in the way that it introduced the idea of the camera zooming in and out which is now a ubiquitous part of 3d (and therefore most) fighting games today. also, the characters, whilst by no means original for the time, have become gaming classics. so in summary an innovative technical benchmark, but one that was still flawed and hasn't aged all too well. Wild Tengu I am FULLY AWARE that KOF takes place in a different timeline from AOF and I am still waiting for an explanation of the glitching storyline and why Yuri isn't an adult in KOF and so on. And if you want to know what is so futuristic about this fancy monitor read my second post of this topic properly. These gaps in my knowledge and the scrambling SNK does is driving me insane! Hell yeah, now this is a game i can get into. Sure the overall game mechanics are kind MK'ish but i still really dig these games. Same here I love it, still play it randomly to this day when I have time. @Will: The timeline makes it so she was born later. I love this game. I can play it without any worries about something throwing it off because it's OLD, and the mechanics are so simple they can't fail. That's why I love it.